Your child’s FM system may have a directional microphone. This can help reduce the effects of background noise and let the child hear your voice or the teacher's voice more clearly. Directional microphones work by emphasizing the sound coming into the top of the microphone and de-emphasizing the sound coming from the sides. 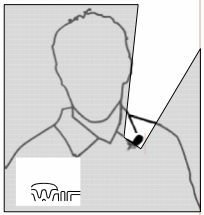 So, to work correctly, a directional microphone must be worn so it is pointing directly at the speaker’s mouth. 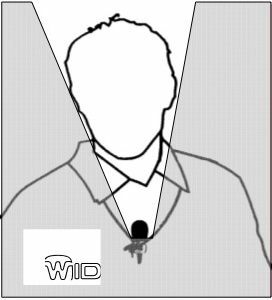 If a directional microphone is worn pointing away from your mouth (for example, towards your shoulder) the microphone will emphasize background noise instead of your voice. This will make it much harder for your child to understand what you say. It SHOULD NOT placed in the centre of a table to act as a “conference” microphone for a group working around the table. A second speaker standing near the person wearing the microphone SHOULD NOT attempt to speak via the directional microphone. In both these examples, the voices of the other speakers will NOT be clearly picked up by a directional microphone. Adjust the microphone so it hangs evenly, about 10 to 15 cm below your chin, pointing at your mouth. The microphone cable functions as an antenna. Try to keep it as straight as possible - don’t twist or knot it! 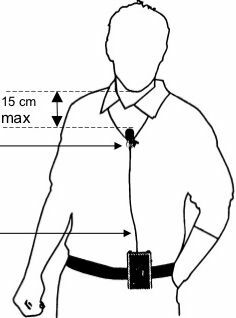 If you choose to clip the microphone to your clothing, please be very careful to arrange it so that the microphone is pointing directly at your mouth. How can I recognise directional microphones on other FM systems? Directional microphones can usually be recognised by the extra sound-entry ports (holes) along the side or back of the microphone. Microlink TX3 Handimic Transmitter used in the Zoom or Super Zoom settings. Phonic Ear grey lapel microphone. Microvox and Sennheiser lapel microphones. Microlink TX3 Handimic Transmitter used in the Omni settings. Phonic Ear brand FMs include the PE475 FM, PEEL systems and Solaris FM systems. If you have any questions about the microphone or FM system, contact your child’s audiologist at Australian Hearing.